Clicking on the product codes and images will take you directly to the product page where you can place an order. Clear blue marker for drawing, tracing & copying. Rinses out in cold water. Useful for applique, patchwork, quilting & embroidery. Easy to see fabric marker which disappears within 48 hours. Use for drawing designs you wish to work on now. Ideal for fabrics that are not suitable for washing. Suitable for embroidery, applique, patchwork & quilting. Rinses out in cold water, or disappears between 8-48 hours depending on the fabric. A fine tip marker that produces a permanent thin black line. Will NOT wash out. Use to personalise or sign your quilting & craft projects. write directly onto garment labels or any fabric for permanent marking. A fine tip marker which permeates (transfers through) paper onto fabric. Use to either dot or trace onto fabric, paper or wood. Useful for patchwork, quilting & most crafts. Fine tip marking pen for dark fabrics, water erasable & medium hot iron erasable. Trace designs onto paper using a finely sharpened transfer pencil, then turn the paper over & iron the design onto fabric. This is a permanent marker therefore the transferred design must be completely covered. Handy for applique, embroidery, fabric painting & craft. 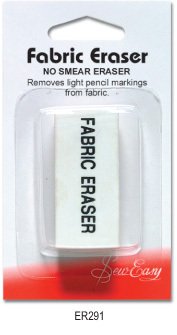 A popular white erasable pencil for marking sewing, cutting & quilting lines easily on dark fabrics. This pencil will brush off most fabrics & is water-soluble. Use this pencil with plain or printed template plastic to mark cutting lines, grain lines & label templates. Silver pencil which will show o most fabrics. For tracing or marking quilting designs. Wipes off with a wet cloth. Designed to remove light pencil marking from most fabric without leaving marks.